I hate typing titles. Like, I despise typing titles. I feel like it boxes me in with decor styles or something. Who knows, I am what I am and I style how I style. I’m also drinking wine as I type this… ha, so I hope all of that makes sense. =) So, today is the day, friends. 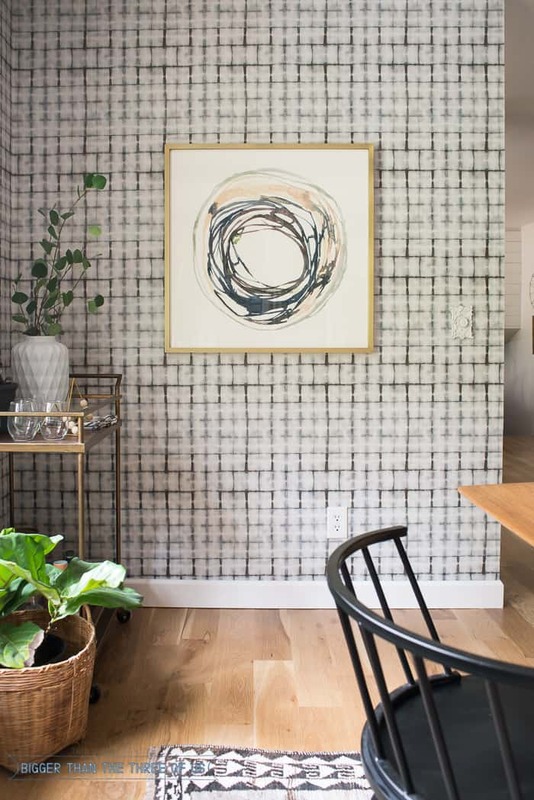 It’s the Eclectic, Classic, Mid-Century Dining Room Reveal. That was a mouthful, wasn’t it? I’m so incredibly thrilled with how the dining room turned out. If you are new here, the goal of the space was to get it to jive with our kitchen. We are at the end of our of kitchen renovation (it looks like the reveal will be in two weeks!) 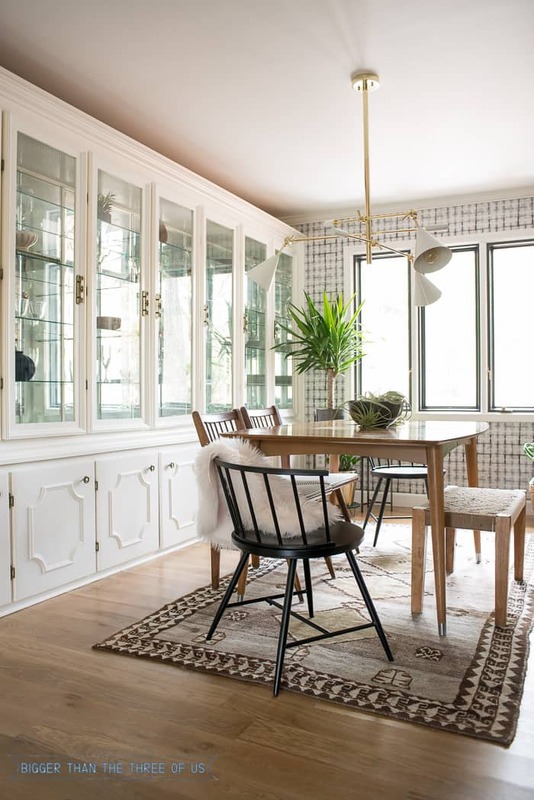 and because the kitchen space is pretty open to the dining room… I wanted to refresh the dining space so that it felt cohesive. I never liked the original dining room. Well, I liked it but I didn’t love it. So, with a budget… I set out to transform the space. Before we jump right in to the new space, let’s walk down memory lane. It was pretty and I genuinely liked it. As the kitchen renovation started to progress and we put up the open shelves in there, I quickly realized that the spaces didn’t jive together. So, when the One Room Challenge, hosted by Calling It Home, was getting ready to start, I was on the fence about participating. I knew I had a space that would be perfect; yet, the challenge to get everything done in six weeks is so hard! I finally decided to go for it and here we are. I’ll share all the sources at the bottom of this post. 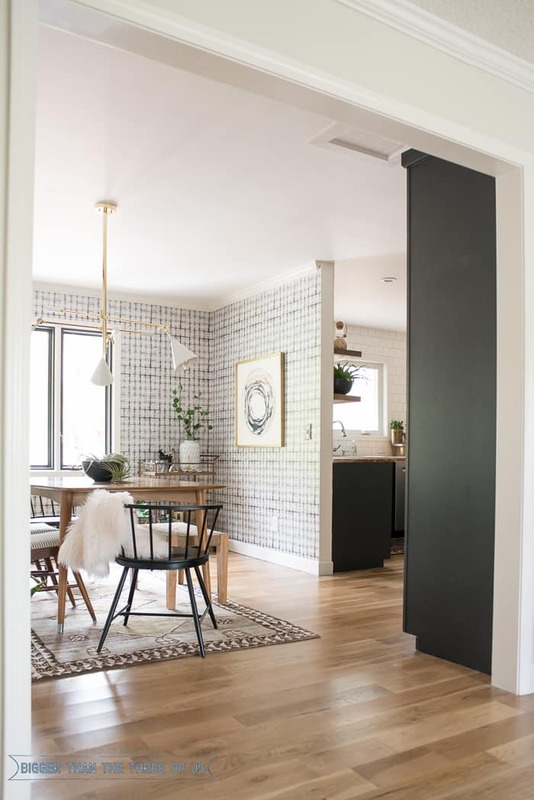 Let’s chat about the game changer for this room – the wallpaper! 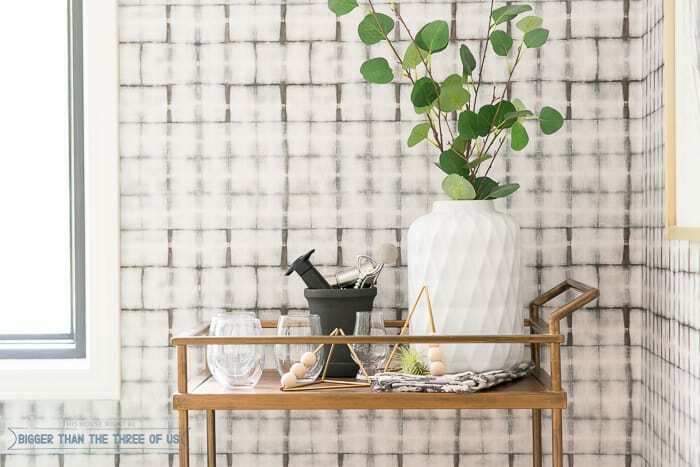 Isn’t that shibori wallpaper just amazing? I went back and forth on two wallpaper samples (the Earth Grey brick that I got and the City Scape in dark indigo). Ultimately, I went with the Earth Grey brick because it was just a perfect match for the china built-ins as well as the kitchen cabinet color. 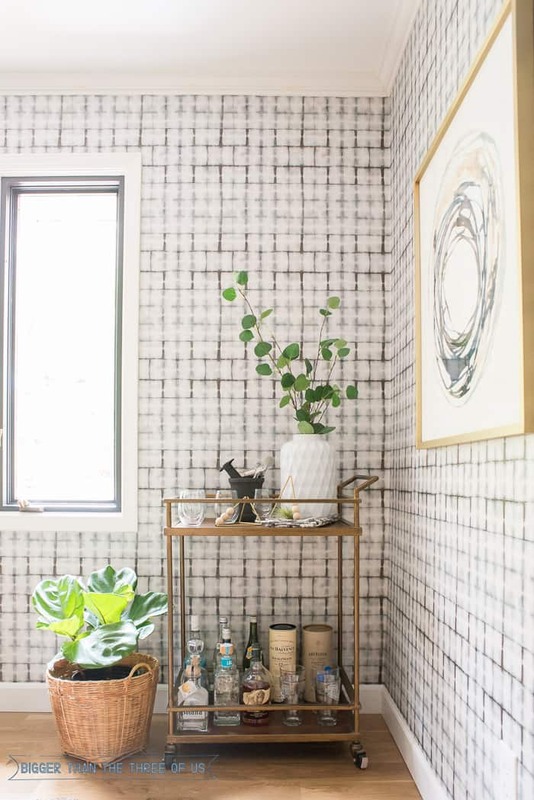 I think the wallpaper set the tone for the space and allowed the space to have something interesting and fun just to itself. 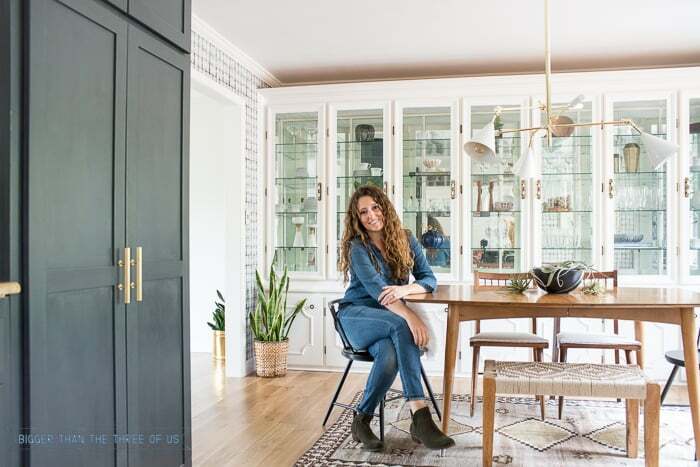 That probably doesn’t make sense if you haven’t seen the kitchen shelves (see them on IG here) but the kitchen shelves are the wow factor in the space. So, the dining room, I felt like, needed it’s own subtle wow factor. To me, the wallpaper is it! Luke and I installed the paper ourselves and it was easy! I’d definitely do it again and a blog post about the process will be coming soon. I went back and forth on whether to change the light or not. We had a gorgeous, all brass and crystal chandelier in there (original to the house). I’m definitely keeping that light and may have another spot for it, but overall I felt like this space just needed something different. I love the texture the paper adds to this next wall! It might be my favorite wall in the dining room. With deadlines, I’m totally a last-minute-type girl. So, of course, we had the wallpaper and everything done over the weekend but I ‘knew’ exactly how I wanted to decorate so I wasn’t stressing putting everything in place. When I actually put the final touches on everything (yesterday! ), I realized that I didn’t love what I was putting up above the bar cart. My original idea was to hang this glass light turned planter above the cart and have an oversized airplant hanging down from it. Well, the glass light totally got lost in the wallpaper. It ended up being just an added thing and not really something that added to the space. So, that idea got nixed. Then, I started stressing about the wall/bar cart corner. I went to every home decor store in town (unfortunately, we live in a small town with small town type stores) and couldn’t find a single thing. That ended up being a blessing though, because I shopped my house and found the perfect thing. How gorgeous is this piece of art in the space? I think it’s totally perfect! I’m not the type of person that buys something for one particular spot in my home. Most of my favorite things can float to different spots and this is a prime example of that. One of my favorite views might just be the next image. I adore how the textures play together. Another game-changer for this space was taking down the window curtains and bamboo shades. It allows so much more light in the space. I love it so much! Plus, that allows me to fill the space with more plants because you know they love that light too! 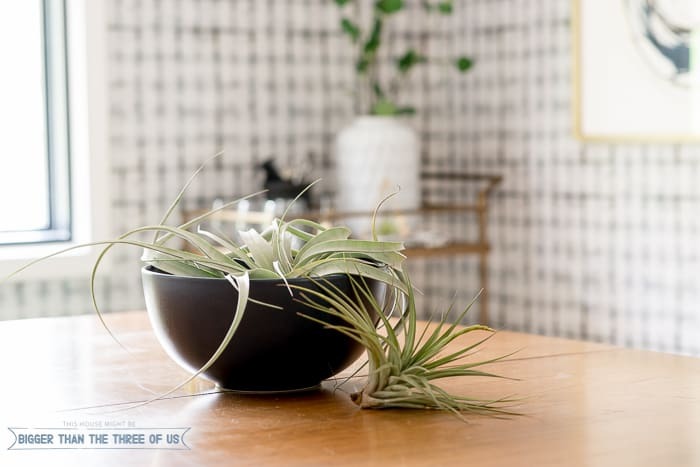 The air plant holders are a very simple DIY. I’ll share that project soon. I’ve been wanting to work with brass piping so I just went for it and totally love how they turned out. After listening to many of your suggestions, we decided to end the wallpaper at the end of the wall instead of wrapping it around to the kitchen. The hubs cut it perfectly and I’m so happy with how that wall turned out. I think the little strip of white paint allows your eye to take in both spaces without either space being too much. If you’ve been around since week one, then you know I had a table dilemma. The dilemma was that I couldn’t afford a table that I liked or if I could afford it then I couldn’t get it shipped here in time. So, I didn’t get a table. I switched the table from the eat-in kitchen. 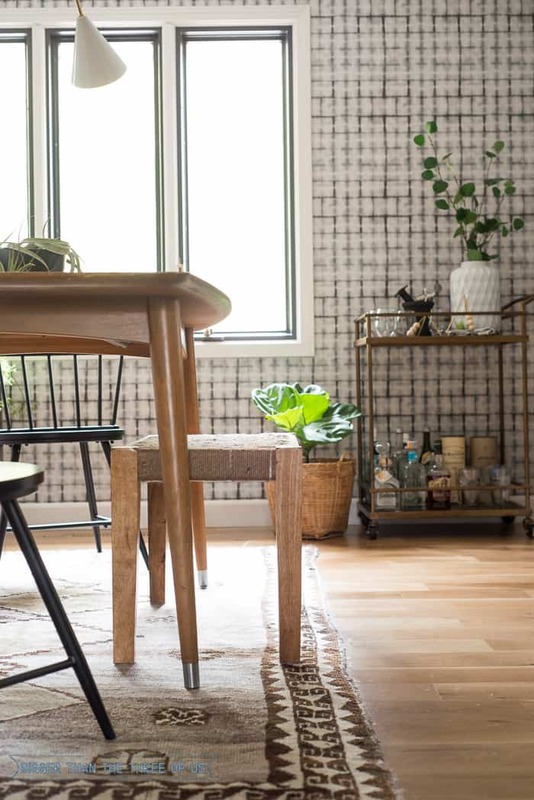 Luke and I both love this table in both rooms but it’s really a perfect size for this space. It has a few leaves (which can extend to about 12ft) and this room can accompany that. In the future, sometime while thrifting or something… I’ll find another perfect table for the other room. But, I’m not in a rush. It will happen when it happens. 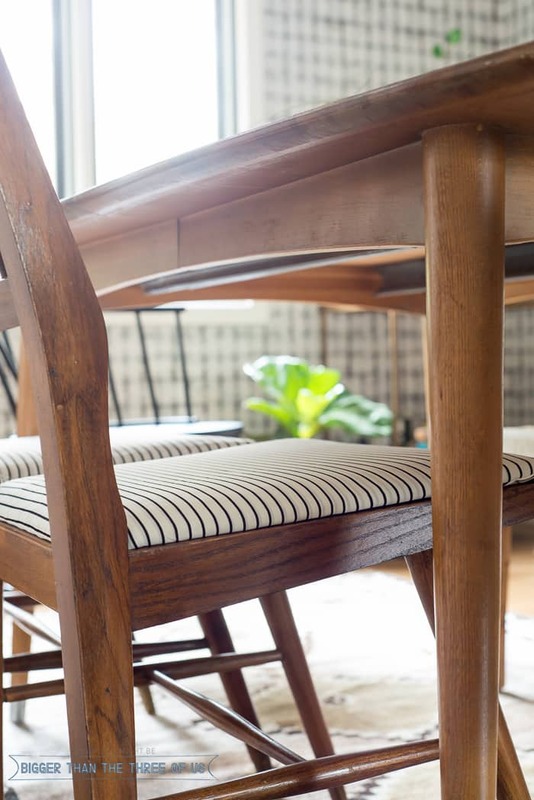 I had the mid-century chairs but updated them with some gorgeous vintage striped fabric that I had in my stash. I LOVE the change. All in all, I think the space turned out so good. I love how it works with our kitchen. It feels like it’s own room yet also feels like and extension of the kitchen space. 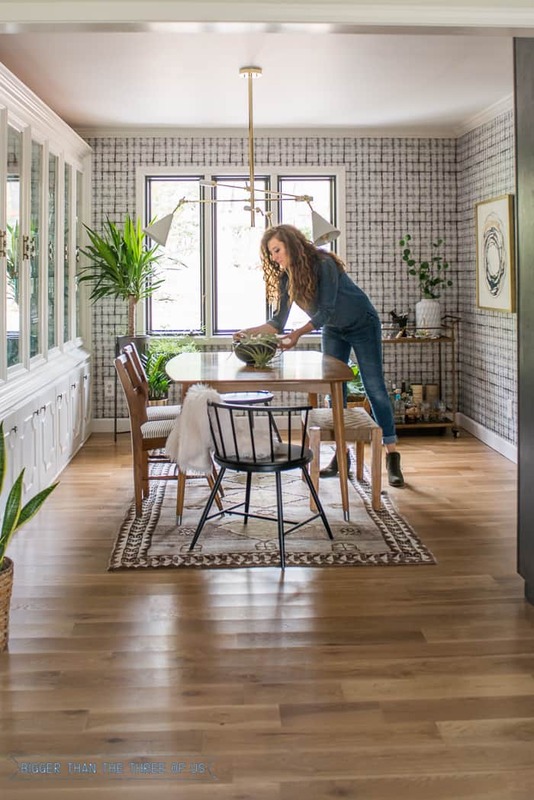 *Edited to add: Pop over to see our kitchen reveal and how it plays with this space! A special thanks goes out to Milton & King for providing the most amazing wallpaper. | Sources | *Affiliate links below. Click to read my disclosure policy. Play catch-up if you’ve missed any of the posts in this series. Wednesday, Oct 5th (week 1) – Introduce your space, and tell us your plan. Wednesday, Oct 12th (week 2) – Show us your progress. What have you accomplished? Wednesday, Oct 19th (week 3) – Have you encountered any setbacks? Any happy accidents? Wednesday, Oct 26th (week 4) – How’s it going? Week 4 is the hardest! Wednesday, Nov 2nd (week 5) – Did you revise your plan? Hang in there, you can do it. This was one reveal I was totally looking forward to! 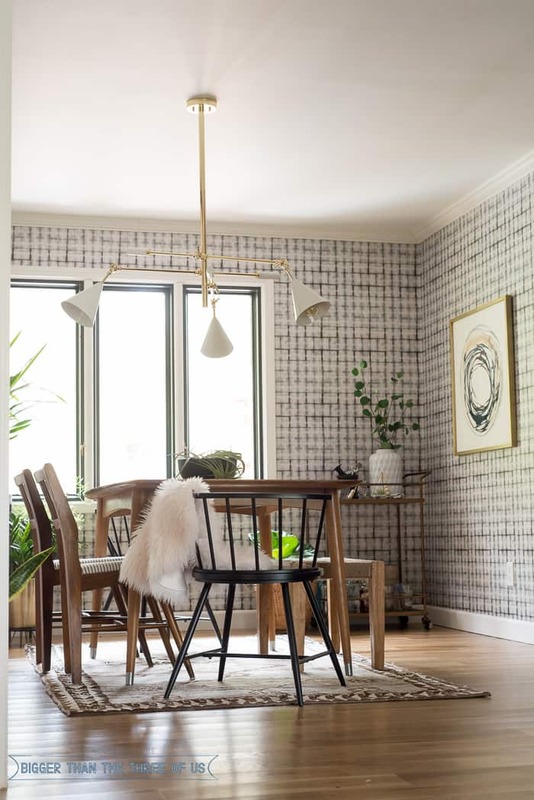 What an amazing space – you totally nailed it with the light fixture and the wallpaper!!!LOVE!! Ashley!! It. it. so. fantastic!!! Wow – I love that wallpaper. The whole space has such a great vibe to it – great job!! Oh girl! This is so fabulous!!! 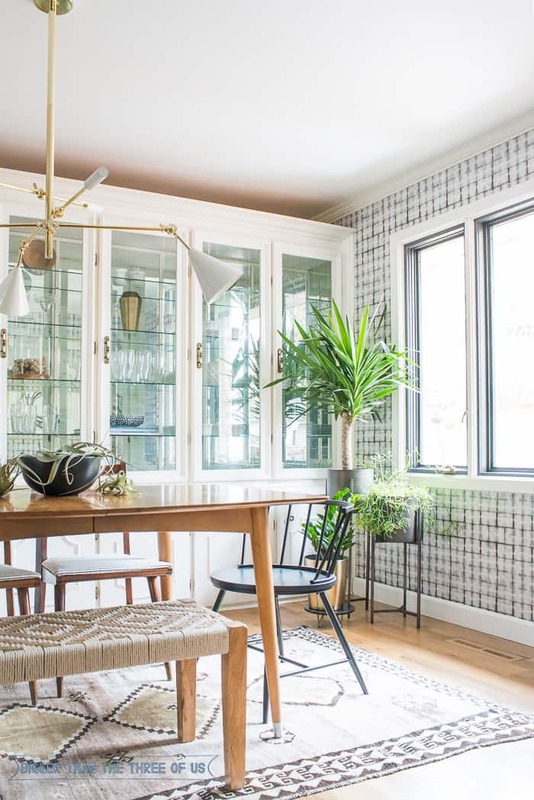 That wallpaper is definitely a show-stopper, but that light fixture! Mmmmm! Love it all! Thanks Brynne! I’m glad I went for the wallpaper – it’s so good! You are a true artist, everything tuned out beautifully.I know what you mean by titles, I guess eclectic would be a good description. Titles are the worst. ha. Thanks so much, Maria! Yes, wallpaper something fast. The airplants around here are way too pricey too. 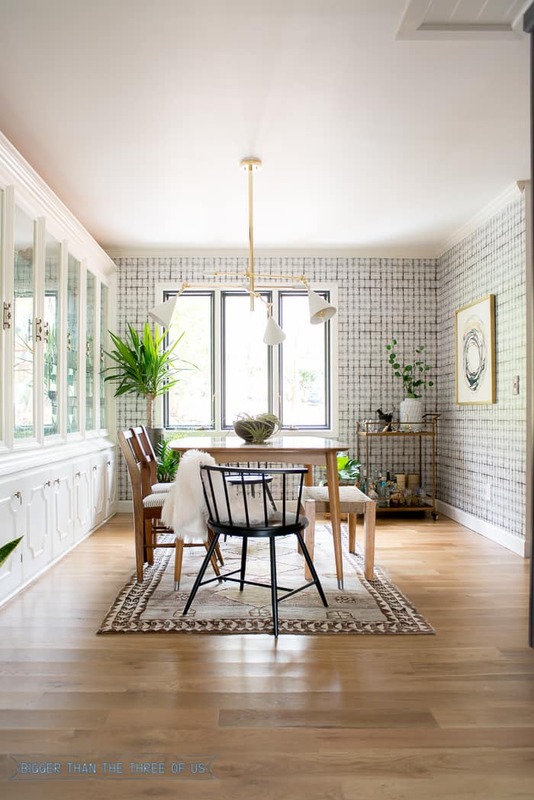 What a beautiful dining room and yes to the wallpaper and the light fixture: total game changers and bravo to the choices + installing the wallpaper yourself! Love your styling too … so clean and crisp. That artwork … I am so jealous! beautifully done in 6 short weeks! Thanks Tim! I didn’t finish the challenge last time around, so it was fun to actually get my room done this time. A-M-A-Z-I-N-G space! The wallpaper was the perfect addition! And total score on buying a house with those gorgeous built-ins! I LOVE IT! 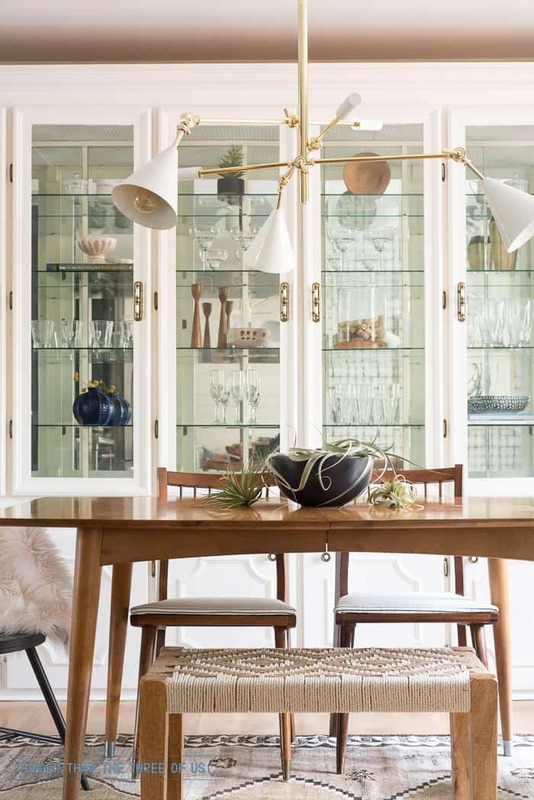 Those built-ins are to die for…and your chandelier…and your chairs! I love every single detail. A GREAT ORC makeover! Absolutely amazing!! And that wallpaper…swoon! Thanks Corey! The wallpaper is a showstopper for sure! OHHH MYYY GAWW! Ashley this is amazing!! I love the wallpaper and the built in styling looks fabulous. Amazing! Just Amazing! Stephanie! That builtin was a beast. I could kiss you for mentioning the styling… I really tried! I need your fab skills to come over and do it for me. Wish we lived closer! Wow! That wallpaper. Well, everything! Beautifully done! I adore your style and it is so well played in this space. Everything is stunning. You really did a fantastic job!! Bravo! This room turned out amazing! I don’t think I could possibly pick a favorite thing. I love it all! Great job! I am just confused who is more beautiful, you or your home. I think both are phenomenal. Ha, you are too funny! Thanks so much! Well this room is just gorgeous!! It flows so nicely with your kitchen, while still having it’s own style and vibe to it. 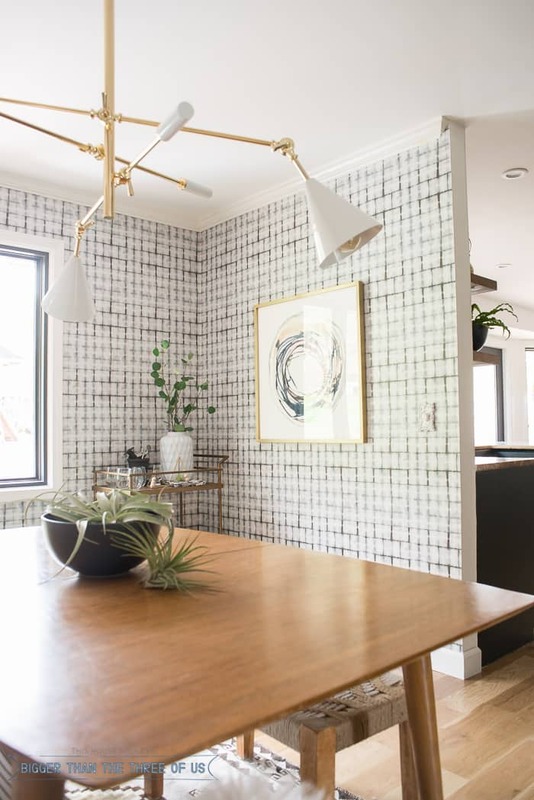 That wallpaper – so amazing, along with that light fixture!! Thanks so much! I’m so thrilled with how it’s working with our kitchen. 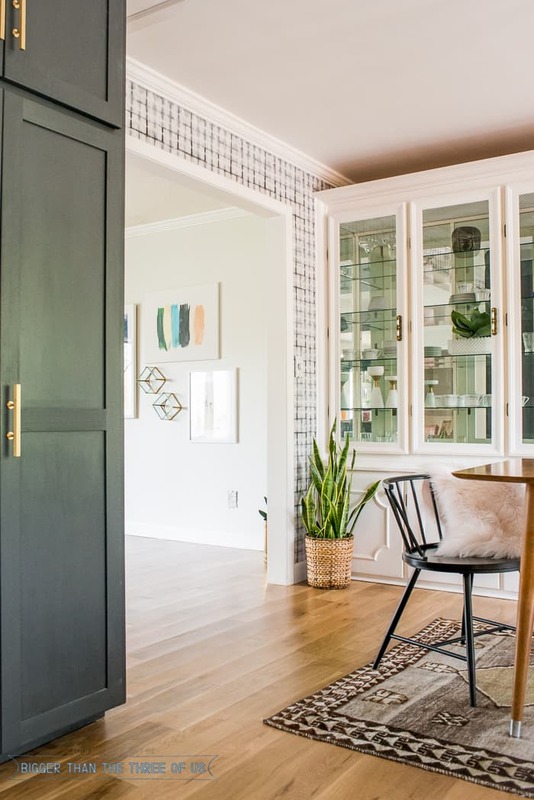 This space turned out so perfect, it absolutely looks like it belongs this way. So many inspired choices–the black chairs, the rug, the light…and of course the wallpaper choice was brilliant. You really know how to rock an ORC! Thanks girl!! The ORC just about kills me but it’s so great to have a completed room when it’s over. I knew this would be amazing, Ashley! I seriously LOVE it all! This is stunning!! 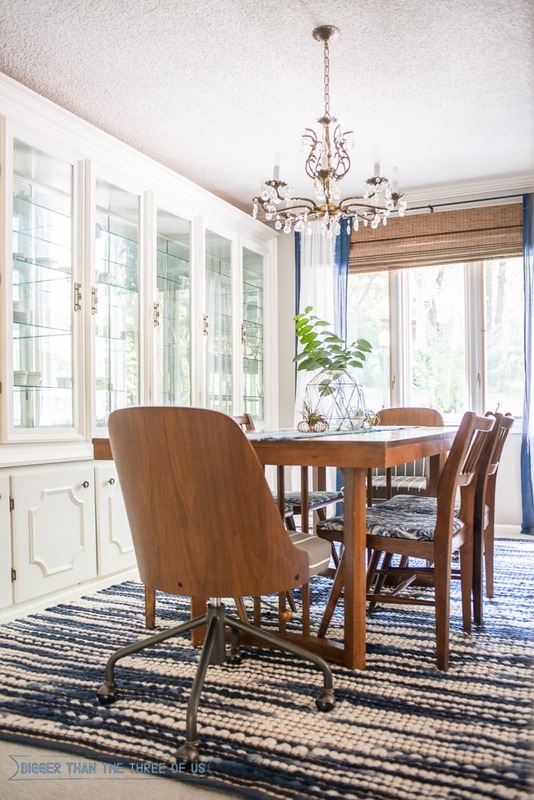 I love how gorgeous this dining room turned out! Congrats on a beautiful reveal! Love how white and bright it is! And those black chairs look so good!! It is so bright now!! I’m amazed at how much light and fresh it feels. Ashley, Your room is one of my favorites! That wallpaper is perfection, and the lighting is gorgeous! Well done! You are the sweetest, thank you CaroL! Yes please…to this whole space! Love it! Fantastic Light Fixture! And that wallpaper! Thank you!! The wallpaper really made the space. 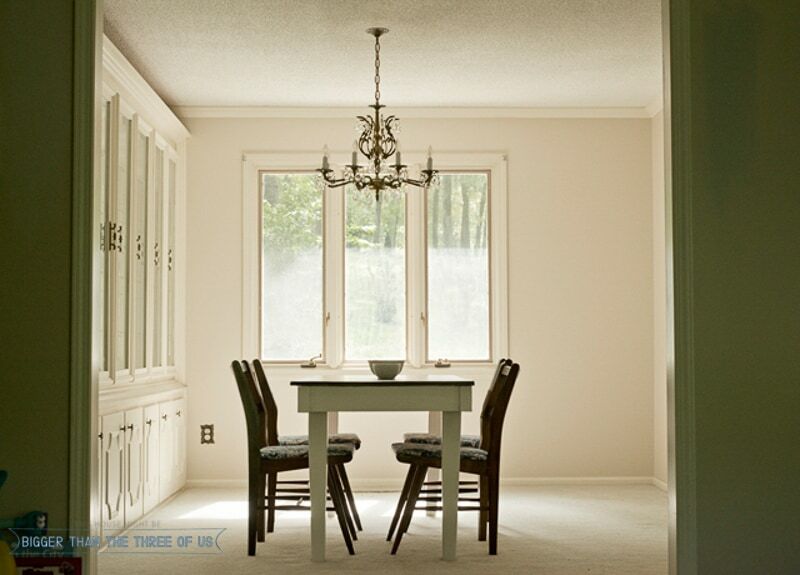 This dining room is so SO great!! I love your use of colour and that light fixture is EVERYTHING!! Lovely work! I love your mid-century style dining room. 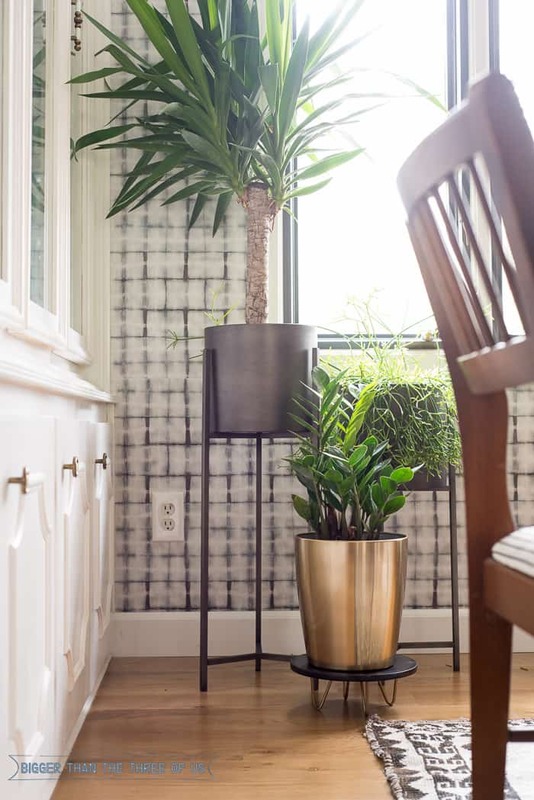 The place looks very cohesive, I love the wall paper, and the indoor plant bring much life to the room! Thanks Nadia! I really wanted the space to feel cohesive! Stopping by from Sunday’s Best. I love the wallpaper and rug together. They make the room pop. Thanks for sharing. The wallpaper really is a show-stopper. Thanks Rhonda! Fantastic room! Love that cool bench! Thank you for sharing on Merry Monday! Sharing on FB! Have a great week! Gorgeous dining room! I love how free it feels in there. Thanks for sharing at Dishing It & Digging It! 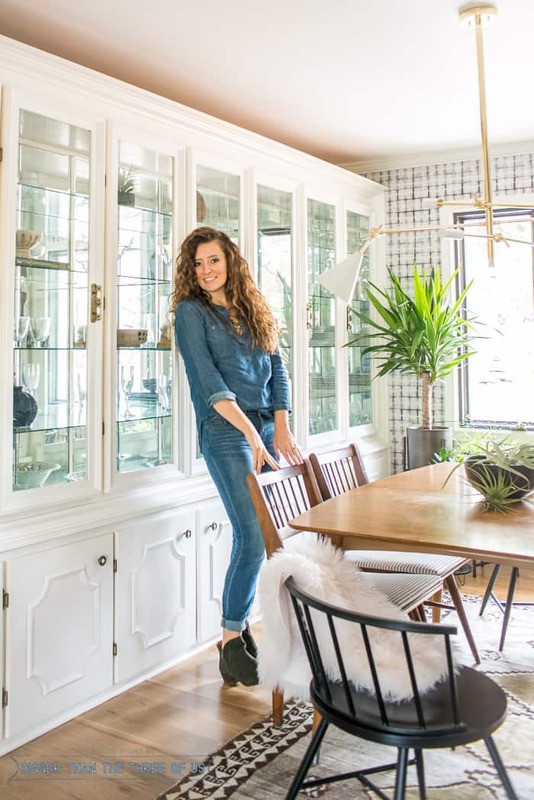 Ashley, your home is amazing, you have the knack of making things beautiful…….. Thank you for finding Oh My Heartsie Girls Friday Features to share. I am now following you on Twitter, FB, Instagram and Bloglovin, shared a few posts too. Pinned and Tweeted. Hope you have a wonderful holiday!!! Karren – you are the sweetest ever, thank you! Love your home! Beautiful. Thanks for sharing at the Inspiration Spotlight party. Shared. Happy Holidays! I absolutely love the cabinets! I so need something like this in my dining room. Thanks for sharing at Funtastic Friday. The cabinets definitely are a big part of the room. Thanks Sherry!